The U.S. Congress blocked moves to restore military aid to Indonesian following reports of its military’s involvement in the 2002 murder of American school teachers in Timika. The blocade was released after the indictment of Antonius Wamang by the Department of Justice. In May 2006 the Bush Administration announced a new Pentagon program that will provide up to $19 million to supplement existing programs for building Indonesian military capacity. Questions remain about whether Wamang acted alone. Where did Wamang obtain bullets? Did Indonesian military agents have prior knowledge of the attack? Why did the Indonesian military sue reporters, doctor the crime scene, intimidate witnesses, and conduct a sham reconstruction? This report is based on internal police documents, court records, eyewitness accounts, and exclusive interviews with Wamang. A verdict in the trial of Wamang and six alleged co-conspirators is expected today. The key points of evidence presented in the trial are equivocal. The Indonesian government has rejected an international role in helping bring the murderers of human rights campaigner Munir Thalib to justice. 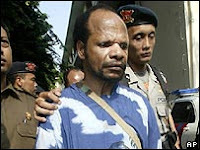 But Indonesia has partnered with the Bush Administration to prosecute some of the alleged murderers at Mile 63. The case was tried by a court that did not follow the rigorous standards of evidence upheld in US court rooms. “Murder at Mile 63” will be released as a three part series: 1) A Trip to the Big City; 2) The Ambush; and 3) The Cover-Up. When Antonius Wamang boarded a Garuda jet in September 2001 at Timika’s Moses Kilangin airport in Papua, his heart was pounding—he was on a mission to get weapons and ammunition in Jakarta. Born in the remote highland village of Beoga in 1972, Wamang was a young boy when Indonesian Brigadier General Imam Munandar launched Operation Eliminate (Operasi Kikis) in the highlands of Papua. Anti-personnel Daisy Cluster bombs, mortars and machine-guns were used against Papuan villagers who were armed with bows and arrows. Nearly 30 years later, Wamang found what he thought was an opportunity to buy arms and to fight back against the Indonesian military. Wamang flew to Jakarta alone and was met at Cengkareng airport by Agus Anggaibak, a sandalwood (kayu gaharu) dealer with close ties to the Indonesian military. According to Janes Natkime, a Beoga native who knows Wamang since elementary school and currently heads the Warsi Foundation in Timika, “Agus Anggaibak set up everything, he lobbied the officers and arranged the money”. Anggaibak, Natkime and Wamang are members of the Amungme tribe, a relatively small group where almost everyone knows everyone else. Anggaibak had earlier visited Wamang’s group in their jungle hideout, encouraging them to raise money to buy guns. He brought a rifle with him. Anggaibak showed off this weapon in Wamang’s camp: “MODEL P88-9, Col 9 mmp AK, Made in Germany.” On 11 January 2006 FBI agents detained “Agus Anggaibak”—a 15-year-old teenager whose real name is Johni Kacamol—and handed him over to Indonesian authorities. The real Agus Anggaibak remains free. In fact, after the 2002 ambush, he become a member of the Timika district parliament as a representative of the Golkar party. Johni Kacamol is in a Jakarta prison. The real Anggaibak promised to help Wamang obtain weapons like the one he was carrying, as well as other guns, from arms dealers in Jakarta. Like all groups in West Papua’s TPN (Tentara Pembebasan Nasional, National Liberation Army)—a group without a clear hierarchical command structure founded in 1971—Wamang’s group was poorly armed. Janes Natkime commented, “Papua also wants to be independent. But we have no weapons. We have no (arms) industry. We are not skilled at making arms. All weapons belong to the NKRI.” NKRI stands for Negara Kesatuan Republik Indonesia or the Unitary State of the Indonesian Republic. It is a name frequently used by Indonesia’s nationalists to emphasize Indonesia’s territorial sovereignty. Antonius Wamang’s group, according to the prosecutor’s indictment and several witnesses, only had three aging weapons: an SS1, an M16, and a bolt-action Mauser. Following several weeks of intensive gold panning, and sandalwood collecting, Wamang’s group raised money to purchase guns. Anggaibak departed for Jakarta, with an advance payment from Wamang, where he began working on securing a deal. Wamang later flew to meet Anggaibak. He brought sacks of sandalwood worth more than 500 million Rupiah. On the international market sandalwood fetches even higher prices. This rare wood is used to make incense and perfume. Initially Anggaibak and Wamang stayed in Mess Perwira Polri—a police guest house in Jakarta. A kayu gaharu middleman from Makassar named Mochtar introduced Anggaibak and Wamang to some Indonesian army and police officers. Well aware of how to exploit internal conflicts within the Indonesian security forces—conflicts that had resulted in a April 1996 shooting match between different branches of the military in the Timika airport —Wamang hoped to secure weapons from one faction in hopes of attacking another faction. Sergeant Puji, a police officer, befriended Wamang while he was staying at the guest house. Sergeant Puji took Wamang and Anggaibak on trips around Jakarta. They toured around while Puji asked them about the activities of Papuan guerillas in the Timika area. Puji said that he wanted to help the movement: he presented Wamang with a gift of six magazines of bullets (a total of 180 bullets) that could be used in Wamang’s M16 or SS1 rifles. Sergeant Puji also gave Wamang bullets for his Mauser. One night in the guest house, Sergeant Puji showed Wamang fifteen M-16 rifles. Wamang says he paid 250 million Rupiah for these guns and Sergeant Puji held on to them for safe keeping. Later Wamang moved to Hotel Djody at Jalan Jaksa 35, a backpacker hostel in downtown Jakarta. He probably checked in using a false name. “Mochtar was a regular guest here. Maybe, yes, Wamang also stayed here but he used another name,” said Herry Blaponte, the hotel’s front office staff. Blaponte said Mochtar had regularly made sandalwood business deals with his Papuan guests. Hotel staff remember Mochtar as having a stocky build and being a “dandy”—their memories of him are not fond, however, since he left without paying his bill. Blaponte and hotel security staff Mahmud Trikasno told Indonesian chief detective Dzainal Syarief that they did not remember Wamang’s stay at their hotel. “I don’t remember his face,” said Trikasno. Four cleaning service staff also did not recognize Wamang’s picture. One afternoon at Hotel Djody, according to Wamang, a stranger approached him and Anggaibak. “I hear you are looking to buy guns”, Wamang quoted the stranger as saying. Eventually Anggaibak admitted that they were. The stranger—Captain Hardi Heidi—said that he was an Indonesia soldier from Surabaya, Indonesia’s second largest city in eastern Java. Eventually Wamang paid for four additional guns from Hardi Heidi: two AKs and two M-16s. As with Sergeant Puji, Wamang arranged for Hardi Heidi to keep the weapons for safe keeping until he was ready to depart for Timika. Hardi Heidi introduced Anggaibak and Wamang to Sugiono, an active duty Kopassus officer who pledged to help transport the weapons to Timika. They all traveled to different cities in Java together—to Bandung, Yogyakarta, and Surabaya. Sugiono and Hardi Heidi had interests similar to Sergeant Puji’s—they wanted to hear about TPN activities around Timika. On September 21, Wamang visited 40 Amungme and Kamoro tribal leaders, who had just returned from negotiations with Freeport McMoran at its New Orleans head office. They were making a stop in Jakarta and stayed at Hotel Mega Matra. Excited to see many fellow Amungme, Wamang visited the hotel a number of times. The tribal leaders were negotiating a profit sharing deal with Freeport’s management. “We left America one day before 9/11,” said delegate Eltinus Omaleng, adding that he knew the attack when checking in into his Hong Kong hotel. After calling associates back in Timika for more money, Wamang traveled alone back to Timika on the Kelimutu passenger ship. Wamang arrived in Timika with only the bullets that Sergeant Puji had given him. His extensive contacts with Sergeant Puji, with Sugiono, with Hardi Heidi, and with Mochtar had given him moments of hope. But ultimately his mission to obtain guns had failed. Instead, Wamang gave agents of the Indonesian security forces almost 12 months advance notice that a TPN attack was being planned in Timika. The Washington Post reported that senior Indonesian military officers, including then commander-in-chief Endriartono Sutarto, “discussed an operation against Freeport before an ambush near its mine in Papua”. Did Indonesian military agents use their advanced knowledge of Anton Wamang’s plans to guide his attack? Citing a United States government official, and other sources who had knowledge of U.S. intelligence reports, The Washington Post reported that the Indonesian military may have staged the attack with the aim of “discrediting a Papuan separatist group”. The Indonesian military subsequently sued The Washington Post for libel. Jakarta newspapers reporting on Indonesian military involvement in the attack were also sued: Koran Tempo and Suara Karya. The Washington Post settled out of court in February 2003. Leaked reports on the FBI investigation’s findings later confirmed intelligence reports. “It’s no longer a question of who did it,” a senior U.S. official told AP in March 2004. “It’s only a question of how high up this went within the chain of command,” said the official. The U.S. Embassy later issued a formal denial that the FBI found evidence of Indonesian military involvement. S. Eben Kirksey has conducted over 17 months of anthropological research in Papua during six separate trips (1998-2005). He earned a M.Phil. from the University of Oxford and is completing his Ph.D. at UC Santa Cruz. Currently he is a Visiting Professor at Deep Springs College, California. Andreas Harsono is a journalist working for the Pantau media organization in Jakarta. He currently writes a political travelogue, “From Sabang to Merauke: Debunking the Myth of Indonesian Nationalism.” He received the Nieman Fellowship on Journalism from Harvard University in 1999.